One may think that anti-matter features only in theoretical physics textbooks or in sci-fi devices, nonetheless it is very much in current use. Positrons are the anti-particle of electrons and their existence was proposed theoretically by Paul Dirac in 1928 and they were observed experimentally a year later. Nowadays positrons have a number of applications, including medical imaging. 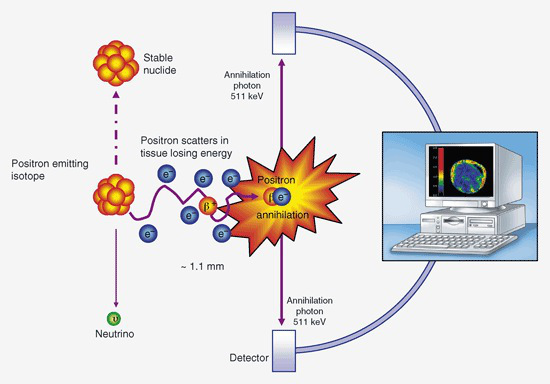 Positron Emission Tomography (PET) is a three-dimensional imaging technique that works by detecting pairs of gamma rays emitted indirectly by a positron-emitting radionuclide introduced into the body. The radioactive tracer is usually injected into the subject, once inside the body it undergoes positron emission decay and it emits a positron. The positron travels in tissue for a short distance, losing kinetic energy until it is able to interact with an electron. The positron-electron interaction annihilates the pair generating gamma rays which are detected by the scanner. Finally the images are built with the aid of computers.